As part of the international call to raise awareness on the importance of proper handwashing in preventing the spread of communicable diseases, Manila Water Foundation will once again lead a month-long celebration of the Global Handwashing Day (GHD). MWF will visit schools, communities, and malls to teach about the seven steps of proper handwashing and the key moments when it should be practiced. To adhere to this year’s theme, “Our Hands, Our Future”, the series of events also aims to educate Filipinos about the role that it plays in keeping one’s health and in attaining a great future. This year’s celebration was launched at The Mind Museum where actor and mother, Bettinna Carlos, shared why she supports proper handwashing as this year’s celebrity advocate. “I support this advocacy because it’s actually the small and simple things that many people do not know that have big effects, such as proper handwashing. This can actually prevent children from having diarrhea and other diseases. As a parent, I am very intentional in teaching this small habit to my child because it will really affect her future,” she shared. At the kick-off event, MWF also invited children being supported by the Educational Research and Development Assistance Foundation, a non-profit organization that focuses on providing educational assistance to elementary school pupils from less privileged families. 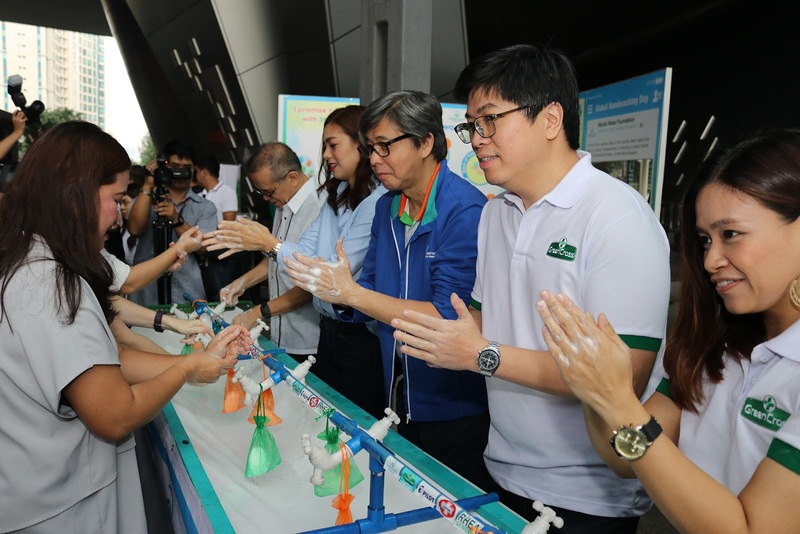 During the whole day of the exhibit, close to 1,000 schoolchildren who came from various schools in Metro Manila and nearby provinces along with their teachers and companions learned about the seven steps of proper handwashing, participated in interactive learning sessions, games, and experiments. These activities were concluded through actual washing of hands and by showing their support to the advocacy by signing their names on the pledge wall. Aside from the event at The Mind Museum, MWF will be bringing the celebration to key locations in Luzon and Visayas. It will be followed by an event in Sta. Rosa, Laguna, Clark, Pampanga, Quezon City, San Mateo Rizal, Enchanted Kingdom, Malay, Aklan, and Market! Market!. To further this advocacy, MWF also aims to activate an online campaign through Facebook and a public chat via Viber. MWF also launched an educational AVP at key locations in EDSA through MMDA’s electronic billboard which will be played until October 31. This year’s celebration is MWF’s fifth year to implement the campaign in the country. During the event, MWF President Geodino Carpio expounded on why MWF continues to support proper handwashing through GHD. “Manila Water Foundation’s focus is on WASH or Water Access, Sanitation, and Hygiene. We implement that focus through a lot of information and education campaigns on the proper use of water, and part of that is promoting proper handwashing. Studies show that 272 million schooldays are lost every year because students are absent from school mainly because of diarrhea and other related diseases which are transmitted by having dirty hands. With us promoting regular and proper handwashing, we hopefully will one day cut that number down to zero and have much productive, happier, healthier, and more educated kids that will lead to a healthier world,” he shared. He also shared that throughout the years, GHD was made possible by forging partnerships. Among those who shared their support to MWF’s 2017 Global Handwashing Day celebration are Green Cross, Pilot, and Philusa Corporation, with the special participation of Nescafe and Toy Kingdom. Venue partners include The Mind Museum, Enchanted Kingdom, and Market! Market! while helping promote the month-long activities and events are Rappler, Eagle Broadcasting Company, Viber, Business World, and Manila Standard. For more details, follow MWF’s Facebook page and Viber public account, Manila Water Foundation GHD 2017.